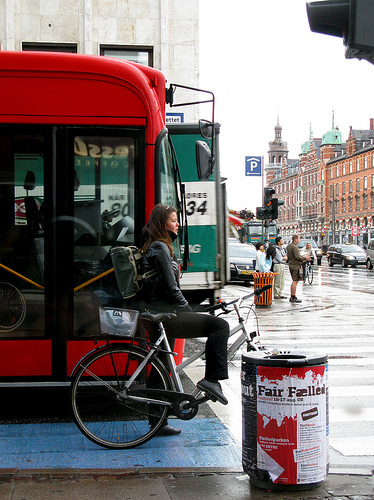 Over at Copenhagen Cycle Chic, a website that plumbs the probing question — just how good can Danish people look on a bike? 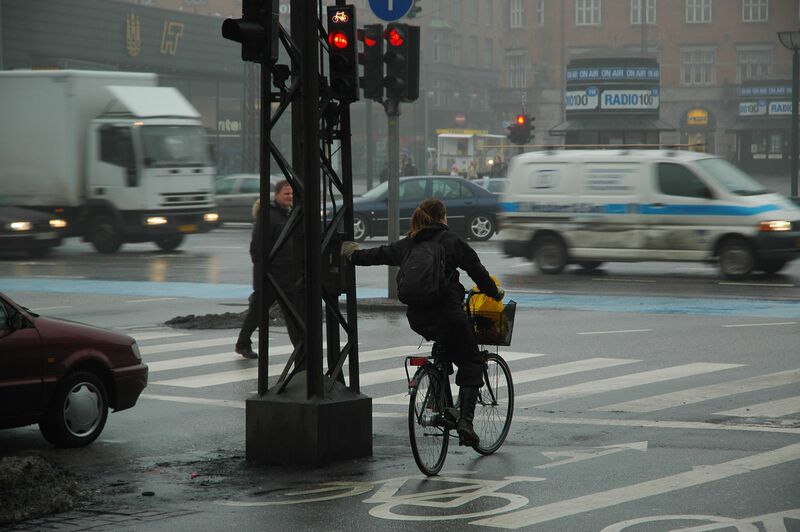 — there’s a nice little photo series under the heading “Things to Do at Traffic Lights in Copenhagen.” One answer, as in the photo to the right, is to simply “pause for thought.” (and look tres chic while doing so). As readers of the book will know, the question of Danes waiting at the lights is of great interest to me. Sitting in warm cafes, looking out the window at crosswalks, I came to find an almost poetic stillness to their modal repose, these pauses of breath, as if the traffic lights were bits of punctuation in the midst of a long stream of urban thought. Like Cycle Chic, I found these activities and poses interesting in their own right, the way even the infrastructure was casually deployed, as in the photo below, in the momentary rest. The other enduring topic of fascination is that scrupulous compliance at the lights, by all modes — but most noteworthy, in my mind, with the pedestrians. I watched this chap below sit at a empty intersection on a cold winter’s morning, one that I would have dashed across as no cars were coming (given the cold I may have dashed across with cars coming); but for him, it just seemed a good moment to stop and reflect on something (he could, of course, have just been thinking, “when will this damn light change,” but I somehow doubted it). 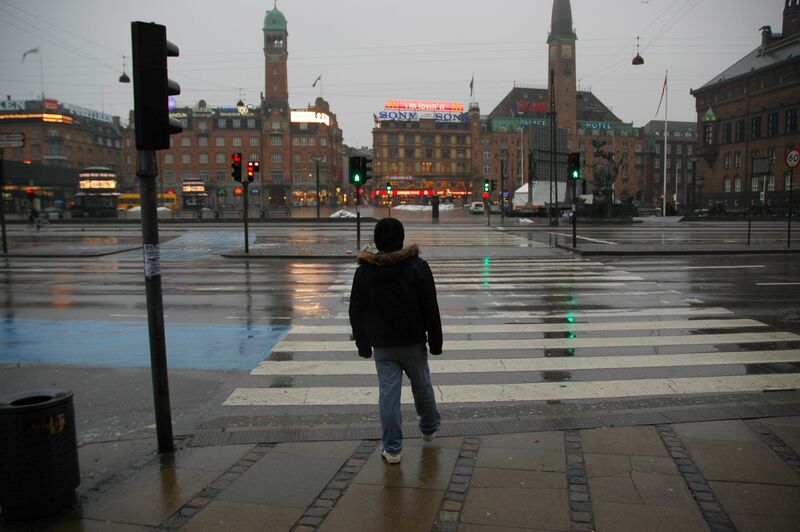 After a day or so in Copenhagen, I quickly found my own normal behavior adjusting. I too became one of those hardy, stalwart Danes, waiting patiently at the light. When I did notice jaywalking, it suddenly seemed somehow inappropriate, and when someone, as the person did below, trundled across in full view of the red man, I could sense a collective unease from the other pedestrians. Typically this seemed to reveal the offender as a tourist. 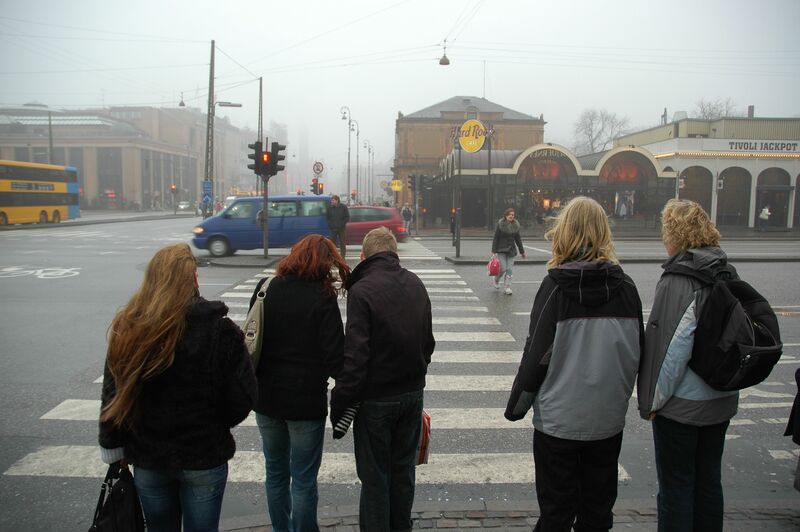 Or maybe they would just regard the jaywalker with a touch of concern, the way it was anecdotally told to me by a queuing theorist: One day, a line of cars sat waiting for a ferry in Denmark. Someone came driving up alongside the queue, in the shoulder, essentially cutting in front of everyone else. The typical response from the waiting drivers: Oh, something terrible must have happened to that person to make them act that way. Comments Off on Waitin’ for My (Green) Man. Click here to leave a comment. The Politics of Late Merging? “Oh, my goodness, if Gorney’s article isn’t a perfect political allegory, I don’t know what is. Gorney is the classic Democrat, fretting about power balances and whether or not someone is getting ahead “unfairly.” She rails against the sidezoomers, even though experts have told her that utilization of all lanes is the most efficient mode. She’s probably also on the side of repealing the so-called “Bush tax cuts” even though some analysts say that these “cuts” resulted in a greater proportion of overall taxes being paid from the high-income group. Padilla, the operations worker, is the classic Republican. He sees the opening and seizes the opportunity. Is this fair? He thinks so. The open lane that allows him to get ahead is equally available to everyone. He probably supports drilling in the Arctic National Wildlife Refuge. Why? Because he wants cheaper gas, and we’ve got it sitting right there! Morgan, the cop, is the classic libertarian. We’ve got enough rules governing behavior already. The sidezoomer is fully entitled to try to cut, the lineupper is fully entitled to try to keep him out. No blood, no foul. Morgan stays the heck out of the vast majority of interactions. Let the games begin. Given my own conversion to late merging, I wondered what this said about my own politics. Creeping Republicanism? Well, actually, the system I advocate is the one tried by engineers in which merging instructions are carefully and precisely laid out (thus allaying feelings of wronged social justice), perhaps even backed by enforcement. So I suppose this makes me a sort of Scandinavian Social Democrat, vis a vis using “big,” rational government planning to engineer effective (yet fair) social outcomes. One is tempted to pursue the potential implications of the politics of merging. Would there be, say, a communist merging scheme? (wealthier cars are sent back to the end of the line in favor of rusty Ladas) A fundamentalist Right stratagem? (whatever lane you are in is God’s will) Anarcho-syndacalist merging, anyone? Comments Off on The Politics of Late Merging?. Click here to leave a comment.